Transparency Market Research (TMR) has announced the publication of a new report, titled “Sodium Lauryl Sulfate Market - Global Analysis, Size, Share, Growth, Trends and Forecast, 2014 - 2020”. The research report provides a comprehensive analysis of the global sodium lauryl sulfate (SLS), sodium lauryl ether sulfate (SLES), and linear alkylbenzene sulfonate (LAS) market. The global SLS, SLES, and LAS market is projected to expand at a moderate CAGR of 5.10% during the forecast period from 2014 to 2020, states the research study. In 2013, the global SLS, SLES, and LAS market was estimated at US$6.6 bn and by 2020, the market is projected to be worth more than US$9.3 bn. The global SLS, SLES, and LAS market is suppressed by the growing awareness about the toxic effects of SLS and SLES. Sodium lauryl sulfate (SLS) and sodium lauryl ether sulfate (SLES) are considered toxic substances that can lead to cancer and other diseases. However, there is no scientific evidence to prove the link between cancer and these substances. Nevertheless, the rising prevalence of the negative public perception of the hazardous effects of SLS and SLES on the skin continues to be a major challenge for the global SLS, SLES, and LAS market. In developed nations, the shift towards biobased surfactants will further restrain the global LAS market. On the other hand, the rising demand for household detergents will fuel the global SLS, SLES, and LAS market significantly. The global SLS, SLES, and LAS market is broadly segmented on the basis of product, application, and region. By product type, the global SLS, SLES, and LAS market is divided into sodium lauryl sulfate (SLS), sodium lauryl ether sulfate (SLES), and linear alkylbenzene sulfonate (LAS). In 2013, the segment of linear alkylbenzene sulfonate held the largest share of 76.6% in the global SLS, SLES, and LAS market. Linear alkylbenzene sulfonate is cheaper and has good emulsifying, foaming, and cleansing properties. Hence, it is commonly used in household detergents and industrial cleaners. By application, the global SLS, SLES, and LAS market is divided into textile and leather, personal care, oilfield chemicals, detergents and cleaners, and others such as paints and coatings, plastics, and agricultural chemicals. 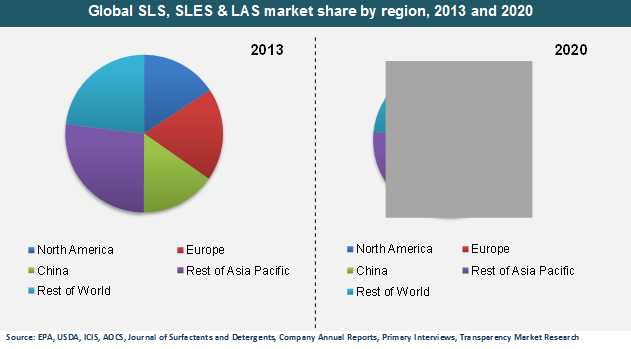 Volume-wise, the segment of detergents and cleaners is expected to lead the global SLS, SLES, and LAS market, followed by the personal care segment. Geography-wise, the global SLS, SLES, and LAS market is classified into China, Europe, North America, Rest of Asia Pacific, and Rest of the World. Asia Pacific dominates the global SLS, SLES, and LAS market in terms of both volume and revenue in 2013. The Rest of the World segment is projected to demonstrate good growth in the coming few years due to the rising disposable income levels in Brazil and the Middle East. Players in the market are competing on the basis of innovation and several key players are involved in significant R&D projects. Some of the key players operating in the global SLS, SLES, and LAS market are Wings Corporation, Unger Surfactants, The Dow Chemical Company, Rhodia SA, Clariant Corporation, and Croda International.